Docents are trained volunteers who give educational exhibition tours to school children, clubs, or special interest groups. AMOCA is recruiting individuals who are eager to work with people, who are community-minded, and who are interested in the benefits of life-long learning. You can make a world of a difference in meeting our mission, and in turn can give you a sense of satisfaction knowing you are doing something worthwhile for someone else. A Docent is a trained educator who volunteers his/her time and expertise. The term comes from the Latin word docere which means “to teach”. Few things are more satisfying than knowing you have helped a visitor to learn and grow. If you enjoy sharing your time and knowledge with visitors, then find out more about this exciting volunteer opportunity. 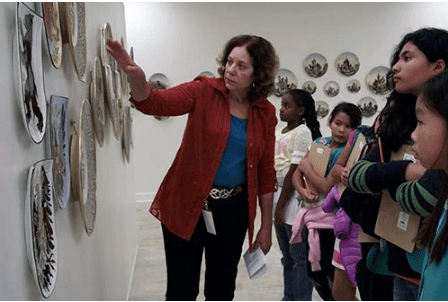 What are some of the things Docents do? Inspire visitors to explore and discover the wonders of ceramic art. Experience the excitement of watching a student’s face as he or she begins to understand new things. Know that you have made a big difference in the way students learn at AMOCA. The Docent training includes fun and interactive sessions on different ways of engaging students and everyday visitors. You will learn how to use Museum objects and exhibitions to make memorable hands-on experiences for visitors. The Docent training class also includes trips to other museums that have established docent programs. Other learning opportunities cover a variety of topics surrounding ceramic art lectures including California art, Latin America art, Contemporary art, Asian art, and much more! Do I need previous experience as an educator? No, docents come from many different backgrounds and career fields. The main requirements are good communication skills, enthusiasm for working with visitors, a curious mind, a willingness to learn, and the enthusiasm for ceramic art. Is there a fee to become a docent? There is no annual fee to become a docent. Can I volunteer in other ways? Yes, there are many volunteer opportunities for Docents-in-training, especially when the Museum holds special programs and weekend events. What are some of the other great things about volunteering as a Docent? Interaction with curators, researchers, etc. Click here to fill out a docent/volunteer application.